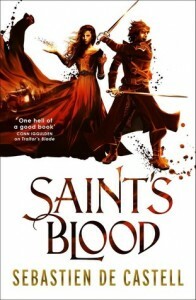 Saint’s Blood (Greatcoats #3) by Sebastien de Castell is an amazing book full of nonstop action, political intrigue and blood violent death from start to finish. 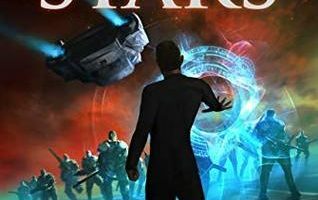 I’ve been a huge fan of the entire Greatcoats series since I first received a copy of Traitor’s Blade back when it first released, and it has quickly become one of my favorite books to reread between new releases. 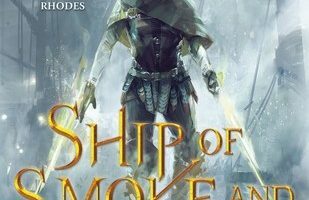 After reading the second book, Knight’s Shadow, I had thought that the books couldn’t get any better. I shouldn’t be surprised that Sebastien de Castell has proven me wrong. Saint’s Blood was everything those first two books were and so much more. As was the case in the first two books, to me the best part of this book was the characters. Falcio, Brasti, and Kest are some of the most realistically flawed characters I have ever read about. Just when you think that they have fucked everything up as much as was possible, they somehow manage to go a step further and make matters even worse. I love the relationship that exists between the three of them and how it has changed and evolved throughout the books as events unfolded. As treacherous and dark as the story gets, you know that Brasti and Kest will always have Falcio’s back and there is little doubt that they will somehow manage to come out on top. 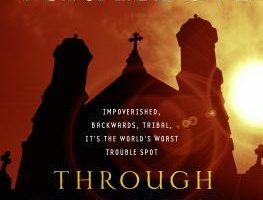 One of the many things that Saint’s Blood does well that I don’t think the first two books touched on much was to delve deeper into the religious aspects of the world. Since I first finished Traitor’s Blade I’ve been wanting to know about the saints and what purpose they serve in the world. With Saint’s Blood we get a fairly detailed look at the saints and at the gods, they are supposed to represent or serve. I hope the last book in the series expands on this even more as it was one of my favorite parts of the series so far. I can’t say enough how much I love this book and series and I refuse to believe that everyone else doesn’t agree with me. 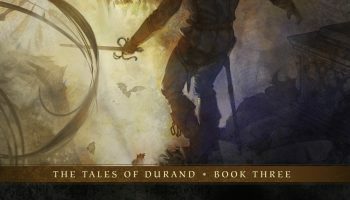 Anyone looking for a book heavily inspired by the Three Musketeers or any kind of epic adventure story should check these books out. Sebastien de Castell has proven to be one of my favorite authors and I really hope to see even more from him in the future. Saint’s Blood is going to be tough to beat as my favorite book of the year. I think Anyone who is a fan of the Three Musketeers or any kind of adventure story love this book and series as much as I do. Sebastien de Castell is an amazing author who I don’t think is getting the credit or exposure that he deserves, and I think this is going to be one of the best books to release this year.